Pregnant women often feel overwhelmed by the endless lists of things they should and should not eat during pregnancy. Because quail is not a popular food choice in the United States, it can be difficult to get information about its safe consumption during pregnancy. In most cases, quail is perfectly safe during pregnancy and offers some valuable nutrients to your growing fetus. Take normal food safety precautions when eating quail, and consult your doctor for help with nutritional choices during pregnancy. Pediatrician William Sears explains in "The Pregnancy Book" that poultry such as quail is safe for pregnant women to consume. The most important foods for pregnant women to avoid are soft cheeses, deli meat, fish high in mercury such as salmon and tuna, raw eggs, raw shellfish and smoked seafood. Undercooked quail can cause food poisoning, systemic infection and damage to the developing fetus. 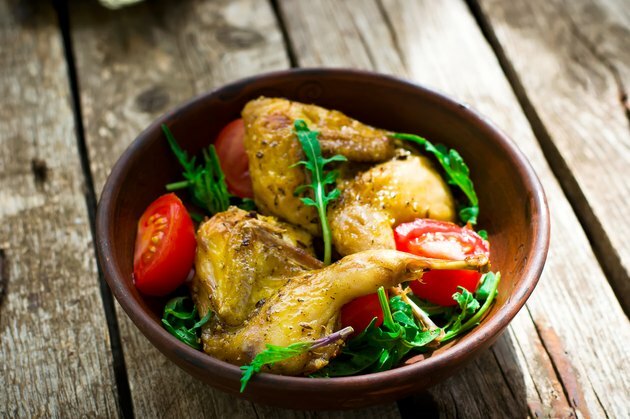 Ensure that your quail is thoroughly cooked and prepared under sanitary conditions. Quail bred on industrial farms or killed in the wild can pose some health risks. Antibiotics and hormones fed to poultry are teratogens, dangerous agents that can cause damage during pregnancy if ingested during certain periods of fetal development, according to neurologist Lise Eliot in her book "What's Going on in There?" While wild quail is generally safer, it's impossible to know if the bird has been exposed to various pollutants and other dangerous chemicals, so pregnant women should err on the side of caution and avoid wild quail. Some pollutants, according to Eliot, also act as teratogens. Quail eggs are safe for pregnant women as long as they are fresh and thoroughly cooked. Avoid eggs that smell bad, have a brown tinge in the yolk or that are past their expiration date. Runny, undercooked eggs pose a moderate threat of food poisoning, according to Sears, and should be avoided. Quail provides several nutritional benefits to pregnant women. Like other meats, it is high in protein, which is vital for proper fetal brain development, according to Eliot. Quail meat contains no saturated fat and is high in "good" cholesterol. The Pregnancy Book: Month-by-Month, Everything You Need to Know From America's Baby Experts; William Sears, M.D., Martha Sears, et al.